Platelets are a type of blood cell that help blood to clot and stop bleeding. Platelets are needed by patients with leukaemia. Patients receiving chemotherapy or a bone marrow transplant and some patients undergoing surgery, especially cardiac surgery and for patients with serious bleeding after an accident. To prevent patients suffering from serious bleeding, lost platelets must be replaced, so platelets given by generous donors are often life saving. They are in great demand. They can only be stored for up to 7 days and therefor stocks need to be constantly replenished. If you are a regular blood donor, are between 18 and 65 years of age, weigh at least 70 kg (around 11 stone), have good veins and meet the required platelet count you can probably become a platelet donor. Additional tests for white cell antibodies, which can cause serious reactions in patients, will be carried out on all female donors and all donors who have had a transfusion of blood or blood products before 1980, prior to acceptance. Platelets are usually collected by a process called plateletpheresis. This process enables enough treatments for one and often two or even three patients to be collected. A cell separator machine is used for this. Blood is taken from your arm in the same way as a regular blood donation. A relatively small volume of your blood then passes through the machine which then collects platelets and some plasma from it. Your blood is then returned to you using the same arm. 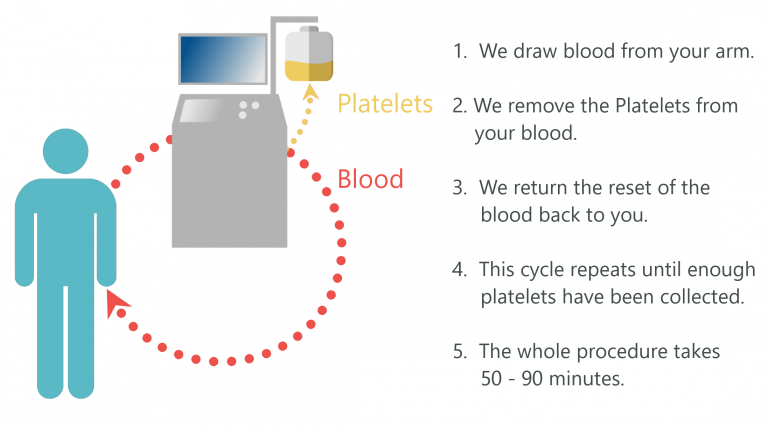 The machine repeats this cycle until enough platelets have been collected. The whole procedure takes 50 – 90 minutes and is undertaken at our headquarters facility in Belfast. Yes, it is safe. In the space of a single day a normal healthy body will replace all the platelets (and plasma), so it is perfectly acceptable to donate platelets on a regular basis (usually once a month). All platelet donation pack materials are sterile and are discarded after single use. The risks are not significantly different than for a standard blood donation and all potential risks will be explained before you start donating. Easy, just phone the Service at (028) 9053 4668 or email us on inet@nibts.hscni.net and we will contact you.